A brief lesson on dam history is useful to understand how most lakes in America are made. Dam history dates back to 3000 B.C. in Jordan but they are used all over the world and have evolved since their inception. Historically dams have been constructed to maintain water for flood control, irrigation, recreation, lock systems for boat navigation, consumption and hydroelectric power. Initially, Congress moved to pass legislation due to several major floods between 1849 and 1936. The Flood Act of 1917 was the first signed by Congress to control floods on around the Mississippi, Ohio, Missouri and other rivers in the Northeast. In America, Flood Control Acts date back to 1917 with the most recent in 1970. For a full list of U.S. Flood Control Acts Wikipedia is useful. As defined by the Missouri Botanical Gardens, hydroelectric power is produced when water passes through a dam into a river. The higher the content of water passing through the dam the more energy there is produced. Three years after the stock market crash, the Army Corp of Engineers had visionary plans to build dams, electrify cities and rural areas and create reservoirs for navigation. As a result of this vision, the famous Hoover Dam was built in 1931. Using the Columbia river, dams were completed in 1933 by Puget Sound Power and Light Company completed Rock Island Dam, downstream from Wenatchee, Washington. Two more dams on the Columbia River began being constructed in 1933 and were completed in 1938 & 1941. The several dams built along the Columbia River gained control over their occasional floods. Not only did these dams create electricity, but they provided desperately needed jobs during the Depression. The main types of dams are arch-gravity dams, embankment dams and masonry dams. There are several subtypes, as well, each named based on the structure and materials used. Arch dams are solid structures made of concrete with an upstream curve. They are designed so that the hydrostatic pressure (force of water) pressing into the arch strengthens the structure by pushing into the foundation. Gravity dams are built with concrete and embankment dams are built with earth or rock fill. Rock fill building material is more economical than other options; however, it is worth noting that more affordable, all materials used for dam construction can be problematic. 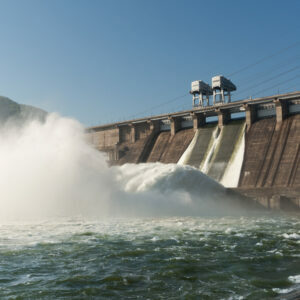 An advantage hydroelectricity has over other forms of energy is that the water can be stored, and then used during peak usage times. It is also easier to start up a hydro plant than a thermal plant. In order for the dam to work, water has to pass from the reservoir to the downstream side of the dam by seepage through and under the dam, passing through or over the main spillway or outlets. Outlet works are provided so that water can be drawn as needed or continuously from the reservoir. They also allow for water to be drawn down so that repairs can be done on the dams. Dams interrupt the natural cycle of a river, and therefore disrupt the plants and animals that depend on the rivers. The dam wall blocks fish migrations, changes temperature and traps sediments. These structures also hold back sediments that would usually replenish downstream ecosystems. Large dams have led to the extinction of many fish and other aquatic species, the disappearance of birds and the loss of forests, wetlands and farmlands. For more on dams, read about the Biggest Dams in the U.S. here! 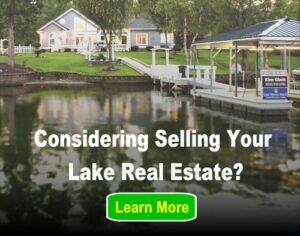 Next post: Lakefront Property: What Are Your Options When Buying at the Lake?